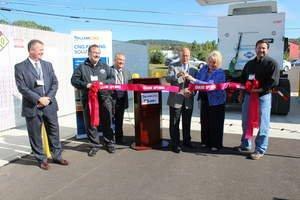 Trillium CNG and Mirabito Energy Open CNG Fueling Station in Binghamton, N.Y.
CHICAGO, IL--(Marketwired - Sep 17, 2014) - Trillium CNG™ and Mirabito Energy Products held a ribbon-cutting ceremony today to commemorate the grand opening of a newly constructed compressed natural gas (CNG) fueling station at 90 Barlow Road in Kirkwood, New York. Mary Boettcher, President of Trillium CNG and Joe Mirabito, CEO of Mirabito Energy, along with Gino Porter, Regional Fleet Manager for Frito Lay, Terry Wood, CEO of Willow Run Foods and John Bernardo, Deputy County Executive of Broome County provided remarks. "We are proud to partner with Mirabito Energy, Willow Run Foods and Frito-Lay, who recognize the importance of making CNG available in the Binghamton area," said Mary Boettcher, president of Trillium CNG. Boettcher added that fleet operators know that we stake our reputation on delivering a great fueling experience for our customers - fast, safe and reliable. "We recognize the need to offer customers a cleaner, more cost-effective fuel alternative and are pleased to partner with Trillium CNG," said Joe Mirabito, CEO of Mirabito Energy Products. The local energy company invested in the new station with Trillium CNG to provide fleets in the area a lower cost fuel alternative. The CNG station is a public access Class-8 fueling station that will operate 24 hours a day, seven days a week and will use Trillium CNG's proprietary fast-fill hydraulic intensifier compressor. There are three fueling lanes today with expansion for an additional two lanes as demand increases. Trillium CNG is a leading provider of CNG to fleets. They offer complete facility design, construction, operation and maintenance services. The company focus is on providing fueling assistance to heavy-duty fleets that require high performance solutions. For more information, visit www.TrilliumCNG.com. Mirabito Natural Gas is part of the Mirabito Family of Companies that operate in eight states with multiple divisions, including Natural Gas and Electric, Home Energy Products and Services, Wholesale Energy Products and Services, Convenience Stores and Mirabito Truck Repair. Mirabito Corporate Offices are located in The MetroCenter, Binghamton, New York. For more information, visit www.mirabito.com. About Integrys Energy Group, Inc.
Integrys Energy Group, Inc. is a diversified energy holding company with regulated natural gas and electric utility operations (serving customers in Illinois, Michigan, Minnesota and Wisconsin), an approximate 34 percent equity ownership interest in American Transmission Co. (a federally regulated electric transmission company) and nonregulated energy operations. For more information, visit www.integrysgroup.com.